My thoughts on Max Scherzer’s $210-million deal with the Washington Nationals are simple: No pitcher is worth that much money, and certainly not for seven years, as the length of that deal is. You never know when pitchers’ arms break down, so a long-term deal is certainly a risk. Then you look at Scherzer’s stats. In his Cy Young year in 2013, the Tigers gave him an average of 5.64 runs of support, and he finished 21-3 with a 2.90 ERA. Now, a 2.90 ERA is certainly respectable, and Comerica Park is no longer considered the pitchers’ park that it was when it originally opened. Having said that, though, a 2.90 ERA in Scherzer’s best year does not make him elite. It’s not like Bob Gibson or Pedro Martinez or Greg Maddux in his best years. It’s not like Roger Clemens or Kevin Brown (whose record deal with the Dodgers back in 1999 turned out to be a bust). Those guys at least posted ERAs under 2.00 in their greatest years and were the dominant pitchers of their time. In the cases of Martinez, Maddux, and Clemens, they had their best years while pitching in hitter-friendly parks (and in Pedro’s case he also pitched at the height of the so-called Steroid Era). At this point, it’s all hype and I’m definitely not buying in. Congratulations to Scherzer on getting that contract. I just don’t think he’s worth it. Thanks to YouTube, we are able to once in a while come across rare videos uploaded by people just like you and me. I recently came across a video of Tom Candiotti pitching for the Dodgers in Philadelphia back in 1993, posted by a YouTube user called Classic Phillies TV. Thank you, CPTV! Now, this wasn’t one of Candiotti’s best games, and most baseball fans will be more interested in seeing a young Pedro Martinez pitch a few innings late in the game. 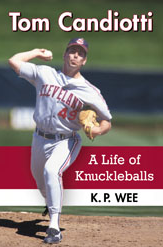 However, following this contest, one in which Candiotti fell to 0-3 with a 6.55 ERA through four starts, the knuckleballing Candy Man would then have a dominant four-month stretch that has since been forgotten. In his next 22 starts following this disaster in Philadelphia, Candiotti posted a minuscule 1.85 ERA and the Dodgers won 15 of those games. Unfortunately, Candiotti’s won-loss record wasn’t great because the Dodgers rarely gave him much support, resulting in a modest 8-2 record in those 22 outings, even with that 1.85 earned-run average. Included in that stretch was a 15-start undefeated streak which saw Candiotti go 5-0 with 10 no-decisions. One of his two losses in those 22 starts was a 2-0 defeat to Atlanta’s John Smoltz, where Candiotti gave up just one run – on four hits – in eight innings (the only run came on a sacrifice fly and then the Braves added that second run in the ninth inning off Pedro Martinez). It’s pretty amazing given the fact that Candiotti threw a knuckleball and yet averaged under 2.5 walks per nine innings. And only six home runs given up in those innings with nearly a 3-to-1 strikeouts-to-walks ratio. That run actually gave Candiotti the National League ERA lead going into September, at a major league-best 2.43. Thanks again, CPTV, for posting the video. One of the bigger stories in the NFL these last couple of seasons has been the controversy over the Washington team’s nickname. While some sportscasters and play-by-play commentators have decided to not utter that nickname during broadcasts, I wonder about a totally separate issue which I think deserves to be discussed. That would be, why do announcers and broadcasters keep referring to Robert Griffin III, the oft-injured and struggling Washington quarterback, as “RG3”? Yes, it’s a completely different issue compared to the team nickname controversy, but my point is this: What has Griffin III done in the NFL to merit a cool nickname? True, he took Washington to the playoffs in his rookie year, but it’s been downhill ever since. A guy whose performance on the field isn’t cutting it doesn’t deserve a nickname, so I wonder if it’s because sportscasters are lazy and don’t want to use the full name that they keep on saying “RG3” constantly. Oh okay, at least “RG3” are Griffin’s initials…but how do you explain Atlanta Falcons quarterback Matt Ryan still being referred to as “Matty Ice”? Ryan has won only one playoff game in five tries, and I still blame him for that pathetic performance in the 2011-12 playoffs where his Falcons got blown out 24-2 by the Giants, who then went on to beat the New England Patriots in the Super Bowl. (Yup, I like the Patriots.) So, does “Matty Ice” refer to Ryan’s play in clutch games, where he always seems to lose? Speaking of Ryan losing big games, why isn’t there more scrutiny on him? It seems like certain quarterbacks don’t get scrutinized enough for their failures, but guys on more high-profile teams get so much abuse from the American national media? (See Jay Cutler of the Bears, Colin Kaepernick of the 49ers, and Tony Romo of the Cowboys, who all seem to be the favorite whipping boys of the media.) Another pivot who doesn’t get scrutinized enough would be Drew Brees of the New Orleans Saints (whom I’m a fan of, by the way), who fell just short (by 48 yards) of an unprecedented fourth straight 5,000-yard season. Sure, his 33 touchdown passes and 17 interceptions were comparable to his TD-INT numbers over the past few years, but his late-game turnovers this year cost the Saints several games, which contributed to the 7-9 season and New Orleans’ failure to win the NFC South. (And I was so sure the Saints were going to win the division especially after they won in Chicago, only to later get eliminated at home by the Falcons. For the interest of full disclosure, the Patriots are my AFC team while the Saints are my NFC team.) And Brees, who turns 36 on January 15, had said prior to the season that he thought he could play another 10 years and was looking forward to another big year in 2014. Had this been Jay Cutler or Tony Romo saying it, you can bet the American national media would have crucified them. But I guess teams like Atlanta and New Orleans aren’t those high-profile teams that you either love or hate. One of those teams would be the Dallas Cowboys, and it seems so many people hate them, even those in the media. There was one guy on Fox Sports Radio (I won’t mention this loud mouth’s name because I do not wish to give him any further publicity) who was hypocritical last week when he acknowledged Lions defensive tackle Ndamukong Suh’s stepping on Green Bay’s Aaron Rodgers wasn’t a clean play, but he practically was celebrating the fact Suh won the appeal of his one-game suspension, allowing him to play in the Wild Card game against Dallas. This radio guy isn’t even a Detroit fan! He was just going on and on about how Tony Romo had just one playoff win, and he was hardly the only one. There have been so many media guys ripping Romo, which is just amazing because this guy was undrafted. Apparently, if you play for the Cowboys and you’re not winning Super Bowls every year, then you’re a bum. Who cares if you’re sort of an underdog (which is what Romo is for getting to the NFL after not being drafted). Amazing, because I thought Americans rooted for the underdog. Of course, that aforementioned Fox Sports Radio guy predicted the Lions were going to beat the Cowboys something like 34-30 in Dallas, without realizing Lions QB Matthew Stafford was 0-17 in his career on the road against teams over .500. The guy also was rattling off the statistic about how Dallas had won just one playoff game since 1996, but didn’t seem to care that the Lions hadn’t won a single postseason game since 1991. I guess it’s all about teams like Dallas and Chicago being hated, and not caring about the struggles of the Falcons and Saints. Heck, for some reason head coach Marvin Lewis in Cincinnati has been scrutinized for not winning a playoff game with the Bengals (he’s now 0-6 there), while nobody cares enough to scrutinize Lovie Smith for having a terrible year with Tampa Bay after turning down the Lions head coaching job, a gig that would have guaranteed him a competitive season given the fact Stafford and Calvin Johnson lead the way in Detroit. I guess Cincinnati should be happy since it means the Bengals for some reason are relevant in the league! Speaking of crappy sports talk show hosts—who just seem to be happy and ecstatic when others fail—how about that guy who does standup comedy and also has his own sports talk show? No, I’m not going to say his name either, but he’s a high-profile guy. I haven’t heard him do standup comedy because I’m not interested, but I have to say his sports takes are just…moronic. He’s the same guy who suggests that professional athletes should be unprofessional and fail physicals on purpose so that they don’t have to go to a crappy team that they’ve been traded to! One of his latest takes was about Matt Kemp being on a great team like the Dodgers and then suddenly having to go to a lousy team like the Padres, and in the process giving up the wonderful lifestyle in Los Angeles including going to Laker games. According to this talk show guy, Kemp ought to just fake an injury so that he could fail the physical and not have to go to the Padres!! Like, yeah, not a funny take at all, and I personally find that most of his takes are horrible. But anyway, since I love sports and want to listen to sports news and discussions/debates, I won’t change the channel. It’s because I love sports, and unlike some of these hosts, I don’t let my dislike or hatred of something take over my life (the way that some of them let their hatred of Tony Romo or the Cowboys cloud their judgement)! And no, I’m not going to refer to certain people as “RG3” or “Matty Ice”!